ISNA Director of Community Outreach Dr. Mohamed Elsanousi joined an international interreligious delegation to meet with His Excellency Ahmed Mouaz Al Khatib, President of the National Coalition of Syrian Revolution and Opposition Forces. ISNA worked closely with Religions for Peace (RfP) to facilitate the meeting, which took place in Cairo, Egypt.Dr. 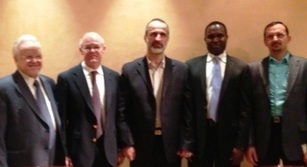 Elsanousi expressed the delegation’s desire to establish a working partnership with the Syrian Coalition. This partnership would focus on building a Syrian multi-religious council equipped to provide humanitarian assistance, prevent sectarian conflict, advocate shared principles for good governance and help to lead a process national reconciliation. The meeting was part of the Islamic Society of North America’s (ISNA) ongoing efforts to address the crisis in Syria. ISNA has also been working closely with Syrian American groups to call on the United States government to increase diplomatic efforts and to call on all people to assist with humanitarian relief for the people of Syria.